I enabled debug logging, and it seems like I get less logging from mount process??? 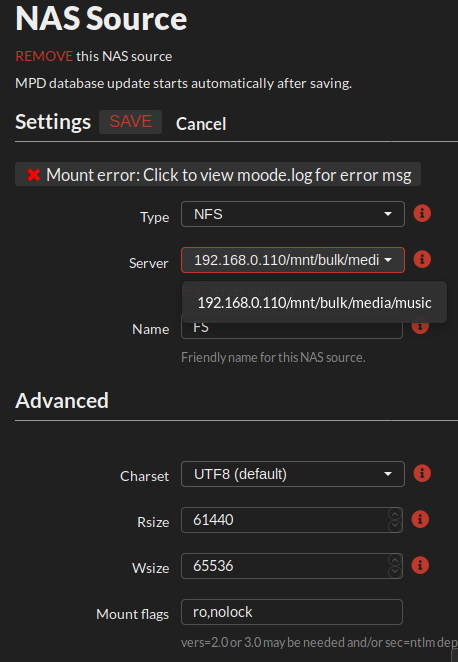 To troubleshoot I'd first make sure that /mnt/NAS dir exists. There is no code in moOde that deletes it and its part of the platform build so it should definitely be there. /MNT/NAS is definitely not there... I'll create it and see what I get. haha now it works after the creations of the NAS folder. I'll image another SD card later to see if i can replicate that missing NAS folder condition. Thanks for confirming that /mnt/NAS was not there. I think this must be a bug because the dir is present on the ISO and there is no code in moOde that explicitly deletes it. I'll need to examine the code and see if I can noodle it out or possibly repro. Glad I could help out. Just waiting on my cable shipment from BlueJeans to put this thing to use. thanks for your time and effort to this project. Current time: 04-20-2019, 09:07 AM Powered By MyBB, © 2002-2019 MyBB Group.